The conventional leather tanning technology is highly polluting as it produces large amounts of organic, inorganic and other types of harmful pollutants. 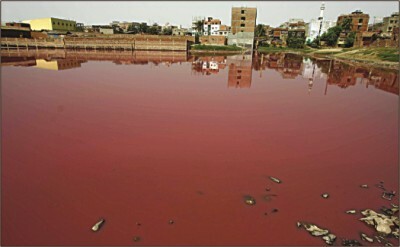 Wastes generated by the leather processing industries pose a major challenge to the environment. According to conservative estimates, about 600,000 tons per year of solid waste are generated worldwide by leather industry and approximately 40–50% of the hides are lost to shavings and trimmings. Everyday a huge quantity of solid waste, including trimmings of finished leather, shaving dusts, hair, fleshing, trimming of raw hides and skins, are being produced from the industries. Chromium, sulphur, oils and noxious gas (methane, ammonia, and hydrogen sulphide) are the elements of liquid, gas and solid waste of tannery industries. Tannery waste can be converted into useful energy through biological and thermal routes. Anaerobic digestion is a favorable technological solution which degrades a substantial part of the organic matter contained in the sludge and tannery solid wastes, generating valuable biogas, contributing to alleviate the environmental problem, giving time to set-up more sustainable treatment and disposal routes. Digested solid waste is biologically stabilized and can be reused in agriculture. The application of biogas technology for the breakdown of COD from tannery wastewater is an attractive method to recover energy from tannery wastewater, apart from resolving tannery waste management problems. Until now it was considered that the complexity of the waste water stream originating from tanneries in combination with the presence of chroming would result in the poisoning of the process in a high loaded anaerobic reactor. Tannery waste contains sufficient quantity of nutrients necessary for the growth and metabolism of anaerobic bacteria for biogas production. A project for demonstration of application of biogas technology for treatment of tannery fleshing and sludge from tannery effluent treatment plants has been set up at a tannery in Melvisharam, Tamil Nadu (India). The plant has been designed to handle about 3 tons of tannery fleshing and 2 tons of primary sludge from ETP. The generated biogas is then used for generation of electricity in a dual fuel engine. When the locally available industrial wastewater treatment plant is not provided by anaerobic digester, a large scale digestion can be planned in regions accommodating a big cluster of tanneries, if there is enough waste to make the facility economically attractive. In this circumstance, an anaerobic co-digestion plant based on sludge and tanneries may be a recommendable option, which reduces the quantity of landfilled waste and recovers its energy potential. Co-digestion plants can also incorporate any other domestic, industrial or agricultural wastes. Chrome-free digested tannery sludge also has a definite value as a fertilizer based on its nutrient content. Anaerobic treatment of high sulphate containing wastewaters can be carried out after reducing sulphate to sulphide, the biological sulphide oxidation process efficiently removes the sulphide from either wastewater or biogas by converting it into elemental sulphur.